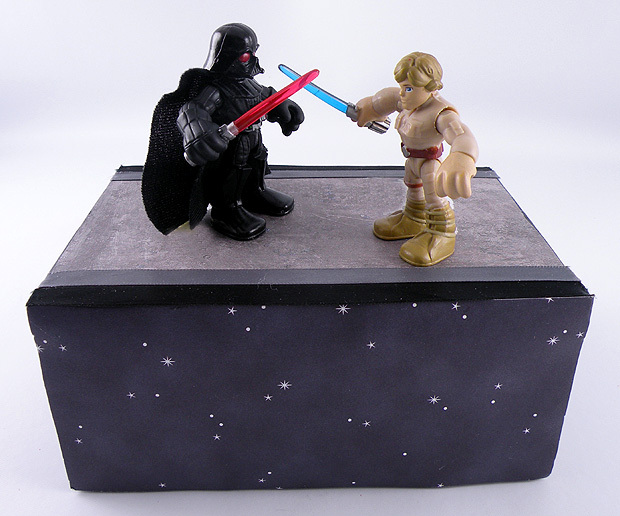 I couldn’t create Father’s Day gift wrap designs without including Luke Skywalker battling Darth Vader from Empire Strikes Back (I told you I was a geek). This is when Luke discovered that Darth Vader was his Father. I think this makes a great gift wrap idea for the Star Wars loving Dad. I can’t think of a better Father/Son movie duo…except for maybe Zurg and Buzz Lightyear. 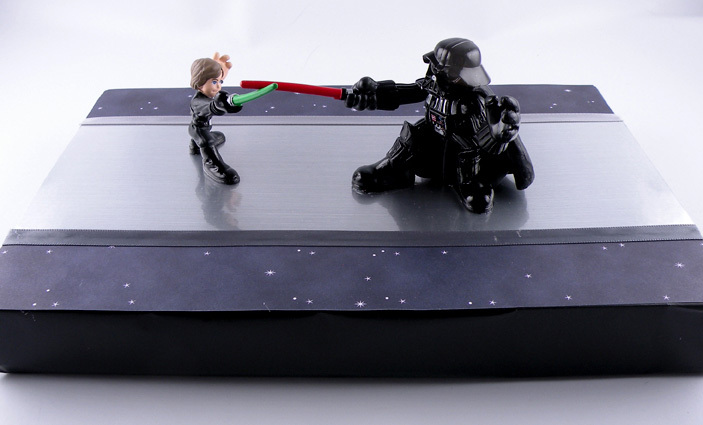 Step 1: Wrap the box in black paper and accent with pieces of space themed scrapbooking paper. Step 2: Add a strip of silver or faux stone paper on top and add ribbon to both edges. I like this because it gives the look of the platform where they were Luke and Darth were fighting. 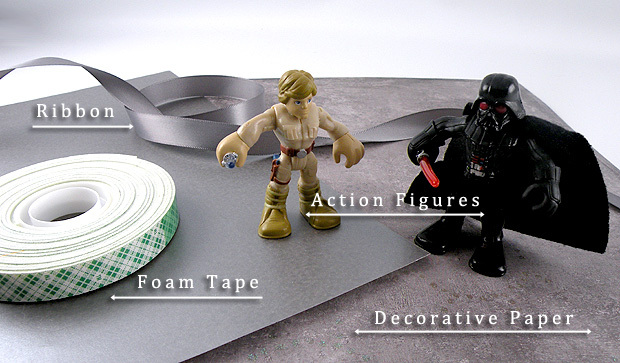 Step 3: Cut small pieces of the Foam Mounting Tape and attach to the bottom of the action figures feet. Attach to the box, positioning the figures as though they are fighting. This entry was posted in Father, Father's Day, Gift Wrapping, gifts and tagged action figures, Darth Vader, Darth Vader Dad, Darth Vader Lukes Dad, Father’s Day, father’s Day gift wrap, Gina Tepper, luke skywalker, star wars. Bookmark the permalink.